Desperately Seeking Adventure: Jewish London - Keeping It Kosher! Shalom Jewish London! Anyone heard of Golders Green or Stamford Hill in North London? Both London neighbourhoods are strictly Kosher but act in very different ways. Since visit Brooklyn's Jewish enclave during the summer of 2012, I wanted to see London's Jewishness. Leave the ordinary because Golders Green and Stamford Hill only deal with the Kosher things in life! Go! I ventured to the 'frum' London neighbourhood of Stamford Hill first to see if Jewish life would be noticeable along the Broadway. Captured to the left is the busy intersection at the heart of Stamford Hill's busy Kosher businesses and daily life. If you look closely enough at the image to the left its easy to see the moms of Stamford Hill carry themselves in a strictly 'frum' manner, the term 'frum' means Kosher in the laws of fashion or clothing to be worn by practicing Jewish women. Contrary to belief Jewish mothers are said to the head of their households whether their husbands like it or not! I'm a stickler when it comes to taking photos for my blog publications so I tried my best to not act like the fool to capture the unique feel of Stamford Hill's lively Kosher Broadway. Jewish culture really interests me because I have a Jewish background, so I just loved it! I wanted to give my Jewish day a good Zetz! OK skiksa?! Let's go! How did I get to Stamford Hill? From my Southwark location I took the London Underground to Liverpool Street station to then take a East Anglia train bound for Stamford Hill, it was a mash of a journey but I got to where I wanted to be eventually. I had big ideas of eating potato kugel and chicken soup for dinner but the closest that I found in Stamford Hill was a Kosher Danish pastry from a bakery called Sharon's Bakery along the Broadway but I had faith in Jewish London so I didn't give up the fight! I felt a very religious vibe whilst walking around Stamford Hill, the walk from the train station showed me the Yesodey Hatorah Secondary School and a Jewish learning centre. It was like walking down Lee Avenue in Brooklyn, NY for the 'frum' mothers went about their business with their babies and children but Stamford Hill had Polish and Brazilian food stores, something that didn't appear along Lee Avenue in Brooklyn. Stamford Hill served Kosher realness through the style of the 'frummy' mummies. The difference between Jewish London and Jewish NYC was that the level of religious conviction conveyed in each respected neighbourhood, Jewish New Yorkers in Brooklyn exuded an ultra Orthodox vibe, so I would strongly keep to that belief. After Stamford Hill, I took the Northern Line to Golders Green to see what London's most popular Jewish area had. Introducing Golders Green, a part of London that screams Jewish London because its just got that popular ring to it. Whereas, stateside in Brooklyn, New York City, the Hasidim of Williamsburg in Brooklyn went about their business in a fashion just like the Jewish community that I saw in Stamford Hill. Aside from my Kosher Danish Pastry I came across Berry's Kosher mini-supermarket that reminded me of Frankel's Grocery on Lee Avenue in Williamsburg, Brooklyn. Could Berry and Frankel be long lost brothers in Judaism? Separated by one big ocean I saw the greatness! My lengthy quest to find a healthy serving of Jewish culture in London was successful in the end! 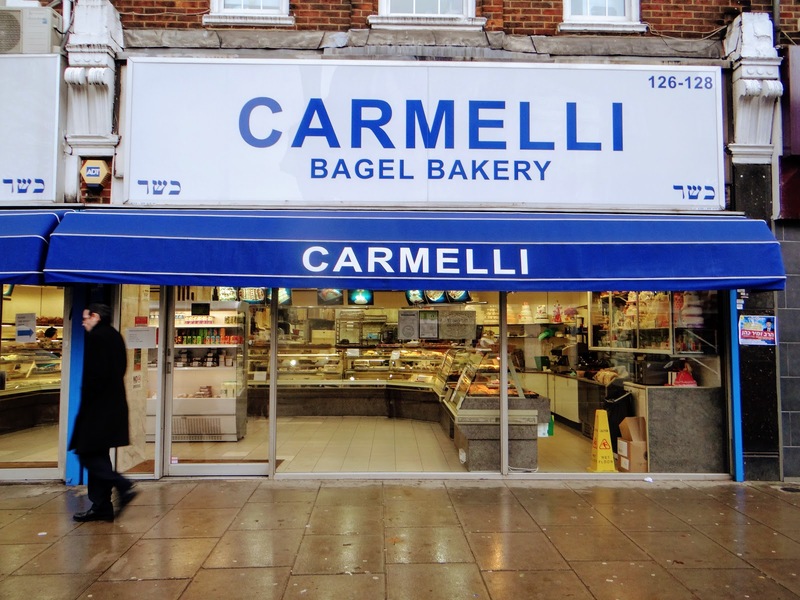 I went to Carmelli Kosher Bakery for a lovely Bagel during my second visit to Golders Green because I didn't know about Carmelli the first time round. 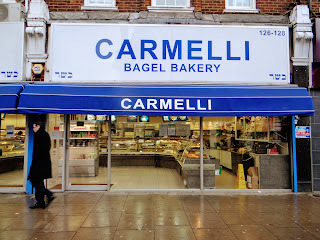 Carmelli's freshly baked bagels tasted amazing, I went for the cream cheese option and it was simply divine! However, I really wanted some potato kugel, but that wasn't meant to be that day! Backtracking to my first moments walking along Golders Green Road, I even saw a Kosher Indian restaurant, a sight that I wasn't expecting to see! During my Williamsburg Jewish pursuit it wasn't so much about the food compared to my time spent in Jewish London but Brooklyn's offerings showed a neighbourhood that didn't appreciate the special attention it received, whereas Jewish Londoners in Golders Greens didn't bat an eyelid because to me I wasn't causing a commotion. Traipsing from Southwark to Golders Green for Carmelli's was worth it! Leaving Stamford Hill I was in hot pursuit of Kosher chicken soup because its also known as 'Jewish Penicillin' I didn't have a cold but I just wanted a bowl for my dinner that day. Choosing Sami's Restaurant on Golders Green Road, I ordered one bowl of chicken soup with noodles and a glass of hot Ribena. The waitress thought I was crazy when I ordered two hot items to eat and drink because the weather was lovely, I wanted chicken soup and that was that! I patiently waited for my 'Jewish Penicillin' and hot Ribena, I was happy that Jewish London had came up with the goods but no potato kugel was on the menu at Sami's. I loved my Kosher dinner that June afternoon for I had crossed London for a special treat, I was very happy indeed. Whilst doing some research on Sami's I know now that the London Beth Din monitors all produce used by the restaurant adheres to Kosher law. Of course, I took notice of the facts because I'm no schmuck! London's got to be the best city in the world? In the end Stamford Hill served its proportion of 'frum' Jewish London with the busy Jewish Haredi or Hasidim women going about their business. Sharon's Bakery served me a nice Kosher Danish pastry like I mentioned earlier but I just had to make that point once again. Berry's gave me something that reminded me of my time in Williamsburg, Brooklyn at Frankel's Kosher Grocery. It was all about finding those some cool Kosher refreshments during the heat of the afternoon! Lee Avenue seemed like a world away during those pursuits but Williamsburg's Jewish offerings haven't left my memory. I travelled across London by train and tube to reach my desired Kosher destinations without any major disruptions so getting from one side of London to the other wasn't such a schelp! I don't know when I'll be keeping it Kosher again? With all this talk of Kosher chicken soup, bagels and sweet treats I'm hungry more Jewish delights! Oy Vey LDN!